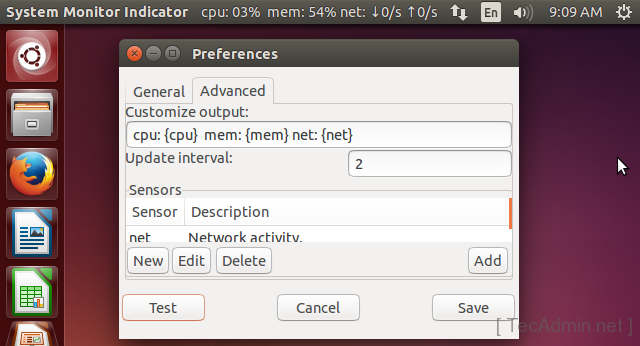 Indicator SysMonitor is an useful utility for displaying cpu and memory usage on the topbar. It also displays various temperature sensors on bar. It also allows users to run there own commands the show the output on topbar. Indicator SysMonitor can works with gnome-panel and Unity properly. Indicator SysteMonitor is bebing maintain by fossfreedom. Use following commands to install it on Ubuntu systems. Open Ubuntu search box and start typing sys…, You will get search results like below. Now just click on “System Monitor Indicator” option, It will start showing cpu and memory uses in top bar like following screenshot. If you want to change display options and want to customize. Right click on Preferences. Now configure Indicator SysMonitor as per your choice.